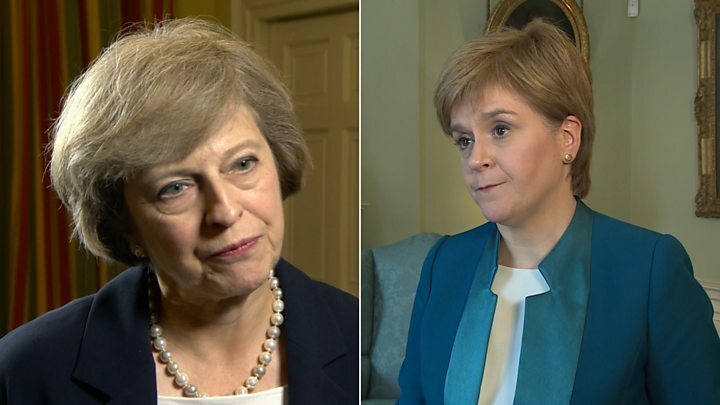 Prime Minister Theresa May has told First Minister Nicola Sturgeon she is "willing to listen to options" on Scotland's future relationship with the European Union. But after talks in Edinburgh, Mrs May appeared unwilling to consider a second referendum on Scottish independence. She said people in Scotland sent a "very clear message" in 2014. Ms Sturgeon said blocking a referendum, if it was wanted by the Scottish people, would be "completely wrong". The first minister believes Scottish interests have been put "at risk" by the result of the EU referendum. She has said she wants to explore all options - including independence - to maintain Scotland's relationship with the EU. New cabinet: Who's in, who's out? Brexit: How could Scotland stay in the EU? Speaking after the "positive" meeting, the prime minister said: "I'm willing to listen to options and I've been very clear with the first minister today that I want the Scottish government to be fully engaged in our discussion. Asked about the possibility of a second referendum on Scottish independence, Mrs May said: "As far as I'm concerned, the Scottish people had their vote - they voted in 2014 - and a very clear message came through. "Both the United Kingdom and the Scottish governments said they would abide by that," she added. "We now have the challenge though as the United Kingdom, to ensure that we can get the best possible deal for the whole of the United Kingdom from the EU negotiations when the UK leaves the EU. "I'm very clear that the government I lead will be for all parts of the United Kingdom and for all people." Ms Sturgeon said: "I was very pleased that Theresa May said that she was absolutely willing to consider any options that the Scottish government now bring forward to secure Scotland's relationship with the European Union, that the process that now takes shape by the UK government will be open and flexible, and that the Scottish government will be fully involved in that. "I have been very clear that we have to make sure that Scotland's interests are protected and I want to examine every option of doing that." The first minister said: "It would be inconceivable for any prime minister to seek to stand in the way of a referendum if that is what the Scottish Parliament voted for, and we have heard from other Conservative politicians in the past few weeks that that would be the wrong thing to do as well. "So I work on the basis that trying to block a referendum, if there's a clear sense that that's what people in Scotland want, would be completely the wrong thing to do." Ms Sturgeon added that she and Mrs May were from "very different places on the political spectrum". But she added: "She's a woman who has a fairly businesslike way of doing things, which I have too. So I think we can find a way of working together, notwithstanding those disagreements." Speaking earlier on BBC Scotland's Good Morning Scotland programme, Scottish Secretary David Mundell described the idea of Scotland remaining within the UK at the same time as remaining in the EU as "fanciful". He told the programme: "I certainly don't think it's possible for Scotland to remain within the EU and the rest of the UK to be outwith the EU. I think that is fanciful." Mr Mundell said he believed both Nicola Sturgeon and Theresa May would have a "constructive" relationship and their collective aim would be to get the best deal for Scotland and the UK in the EU negotiations. However, he warned: "Of course it's not going to be doable on a basis that satisfies Nicola Sturgeon's ultimate aim of making Scotland an independent country. "Theresa May doesn't agree with Scotland being an independent country, I don't agree and two million people in Scotland who voted in our own referendum don't agree with that. "So we're not going to be in agreement with that and we're not going to be in agreement with the idea that there should be another independence referendum." Also speaking on the programme, the SNP MP Stephen Gethins, who is the party's spokesman on Europe, said he would like to see an acknowledgement from Westminster that Scotland voted differently from the UK referendum result. He said: "We can find innovative political solutions to this if only the Westminster government are willing to listen." He added: "You can find a solution whereby Scotland remains in the European Union within the United Kingdom, there are ways you can do that. "Independence is also an option, but that's only one of a number of options that are being considered. "But if you look at the way the European Union and the United Kingdom have found solutions over the past 40 years, I'd been very surprised if the political will is there, that they can't find a solution to this particular impasse at the moment."